Ukrainian pilot cosmonaut 1976-1998. Father of cosmonaut Sergei Volkov. 391 cumulative days in space. Status: Inactive; Active 1976-1998. Born: 1948-04-27. Spaceflights: 3 . Total time in space: 391.49 days. Birth Place: Gorlovka, Donetsk. Graduated from Chuguyev Higher Air Force School, Kharkov, 1970. Graduated from Military Academy, Moscow, 1991. Colonel and test pilot, Soviet Air Force. Cosmonaut training 23 August 1976 - 30 January 1979. From 1990-1998 Commander, Cosmonaut Detachment. Retired from active duty on 11 October 1998. From 2000, President of television channel Mus-TV, Moscow. Family: Cosmonaut. Country: Ukraine. Spacecraft: Salyut 7, Mir. Flights: Soyuz T-13A, Soyuz T-14 EO-4-c, Soyuz T-14 Salyut 7 EP-5, Soyuz TM-4, Soyuz TM-7, Soyuz TM-7 Aragatz, Soyuz TM-12, Soyuz TM-13A, Soyuz TM-13, Soyuz TM-13 Austromir. Agency: VVS. Bibliography: 4452, 6160. 1948 April 27 - . Birth of Aleksandr Aleksandrovich Volkov - . Nation: Ukraine. Related Persons: Volkov, Aleksandr. 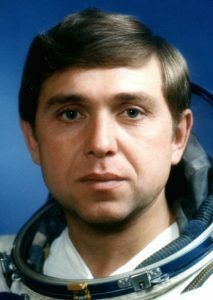 Ukrainian pilot cosmonaut 1976-1998. Father of cosmonaut Sergei Volkov. 391 cumulative days in space. 3 spaceflights, 391.5 days in space. Flew to orbit on Soyuz T-14 (1985), Soyuz TM-7, Soyuz TM-13..
1976 August 23 - . Soviet Air Force Cosmonaut Training Group 6 selected. - . Nation: Russia. Related Persons: Ivanov, Leonid, Moskalenko, Protchenko, Saley, Solovyov, Titov, Vladimir, Vasyutin, Volkov, Aleksandr. 1985 November 21 - . Landing of Soyuz T-14 - . Return Crew: Savinykh, Vasyutin, Volkov, Aleksandr. Nation: Russia. Related Persons: Savinykh, Vasyutin, Volkov, Aleksandr. Program: Salyut 7. Flight: Soyuz T-13 EO-4-a, Soyuz T-14 EO-4-c. Soyuz T-14 landed at 10:31 GMT with the crew of Savinykh, Vasyutin and Volkov Aleksandr aboard..
1987 December 21 - . 11:18 GMT - . Launch Site: Baikonur. Launch Complex: Baikonur LC1. LV Family: R-7. Launch Vehicle: Soyuz-U2. Soyuz TM-4 - . Call Sign: Okean (Ocean ). Crew: Levchenko, Manarov, Titov, Vladimir. Backup Crew: Kaleri, Shchukin, Volkov, Aleksandr. Payload: Soyuz TM s/n 54. Mass: 7,070 kg (15,580 lb). Nation: Russia. Agency: MOM. Program: Mir. Class: Manned. Type: Manned spacecraft. Flight: Soyuz TM-2 Mir LD-1, Soyuz TM-3, Soyuz TM-4, Soyuz TM-4 LII-1. Spacecraft Bus: Soyuz. Spacecraft: Soyuz TM. Duration: 178.95 days. Decay Date: 1988-06-17 . USAF Sat Cat: 18699 . COSPAR: 1987-104A. Apogee: 357 km (221 mi). Perigee: 337 km (209 mi). Inclination: 51.60 deg. Period: 91.50 min. Mir Expedition EO-03. Carried Musa Manarov, Anatoly Levchenko, Vladimir Titov to Mir; returned crew of Soyuz TM-5 to Earth. Orbits 168 x 243 km, 255 x 296 km, 333 x 359 km. Docked with Mir 12:51 GMT 23 December. 30 December moved to forward port..
1988 December 9 - . 09:57 GMT - . EVA Mir EO-4-1 - . Crew: Chretien, Volkov, Aleksandr. EVA Duration: 0.25 days. Nation: Russia. Related Persons: Chretien, Volkov, Aleksandr. Program: Mir. Class: Manned. Type: Manned space station. Flight: Soyuz TM-4, Soyuz TM-6 Mir LD-2, Soyuz TM-7, Soyuz TM-7 Aragatz. Spacecraft: Mir. Deployed ERA (French experiment)..
1989 April 27 - . Landing of Soyuz TM-7 - . Return Crew: Krikalyov, Polyakov, Volkov, Aleksandr. Nation: Russia. Related Persons: Krikalyov, Polyakov, Volkov, Aleksandr. Program: Mir. Flight: Soyuz TM-6 Mir LD-2, Soyuz TM-7. Soyuz TM-7 landed at 02:59 GMT with the crew of Krikalyov, Polyakov and Volkov Aleksandr aboard..
1992 February 21 - . 20:09 GMT - . EVA Mir EO-10-1 - . Crew: Krikalyov, Volkov, Aleksandr. EVA Duration: 0.18 days. Nation: Russia. Related Persons: Krikalyov, Volkov, Aleksandr. Program: Mir. Class: Manned. Type: Manned space station. Flight: Soyuz TM-12 Mir LD-3, Soyuz TM-13. Spacecraft: Mir. Dismantled equipment..